This rustic twine and lace pocket invitation is perfect for your rustic outdoor or pavilion wedding. 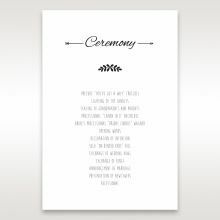 The invitation is printed in raised thermographic ink. This display features a simple, hand-printed font, but you may select any font and wording you want. The cover is made of heavy duty craft cardstock and the insert is a soft creme colour and slightly ribbed pattern. Coloured inserts are not available due to the simplicity of this design. 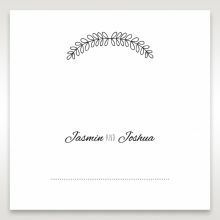 The stationery suite is printed with the same leaf garland you see on the invitation, tying it all together. Add a bridal bouqet of sunflowers, and you are all set! I ordered the sample and they arrived reasonably quickly. I absolutely loved the invitations! They looked exactly the same as the picture online. However I was disappointed that the sample came with a RSVP & Wishing Well card that did not match the invitation at all. I think this must have been a mistake as the website says that they should match. I will be ordering these invitations for my wedding shortly. I ordered a few samples to see the quality and how it looks in real life and all the samples I received looked just like the photos and the quality is amazing. I love the design and the way you pull the card out. It's a great idea and it arrived in less than a week, I absolutely love it! I will definitely be ordering it for my engagement very soon! I would also be ordering other designs for my wedding! Wow! We loved the invitations we ordered and got so many great comments about them. The whole process was really easy from start to finish. Changes were made without a hassle and always quickly and the turn around from ordering to receiving them was really fast! The attention to detail was lovely and finished to a really high standard. Overall we are very happy and will definitely order again should we ever get the opportunity to. This invitation combines the right mix of elegance, in the precise laser cutting, and rusticity in its textures and colour, for our outdoor wedding. 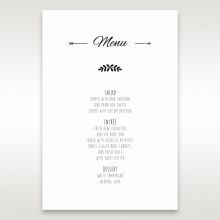 It feels like an invitation that would impress a recipient, and impress on them the theme to expect from the event. The pocket isn't just "cardboard" - you can see the fibres in its makeup, it feels like art card - and the off-white, textural invitation part, with slightly raised lettering, combines nicely. I'm pretty sure we have decided to pick this one for our invitations. I looked at many cards and could not find one that matched my rustic theme wedding we are planning. I’m so glad I came across giant invites and found the lace pocket to be just the one that best matched all my requirements. I look forward to ordering this for my wedding card and is currently going through revisions. The sample arrived on time and provided us plenty time to think and place the order. The quality is really worth the price. Love the elegance of the invite. We ordered 5 samples and it was so hard to decide between the 5. We ended up choosing Country Lace Pocket but all of the designs were so pretty. Country Lace Pocket in particular had a nice mixture of elegant and rustic which is what my daughter's wedding is based on. The order was here in less than a week. Website very user friendly and the samples are cheap so you can order many to get just the right design. After looking around at so many different invitations we found the country lace pocket invite from Giant invitation and it was everything that we were looking for. It has the lace detail without being old fashioned yet is so simple and timeless. We absolutely love this invite and can’t wait to send them out to all of our guests as we are so proud of them! We hope that they all love them as much as we do! Love the country lace pocket invitations, it matches our theme perfectly.The sample we received was beautifully designed and exactly as pictured, we will be ordering our invitations and matching stationary this month.I also couldn't fault the instore customer service, she was very helpful and was able to find a few designs that were exactly what i liked, even with my lack of direction and we settled on this fabulous design. I am so happy that i stumbled upon this site, we ordered a few samples that we liked and we were very surprised when they arrived as they were so lovely we still cant decide on just one. Thank you so much giant invitations! We cant wait to put our order in when we finally pick which sample we love more. The time it took between ordering and delivery was so short, nee i was very impressed i definatly reccomend giant invitations!! Fantastic service and amazing products!! Thank you so much for the wonderful, professional team at Giant Invitations. What a pleasing and straight forward experience! 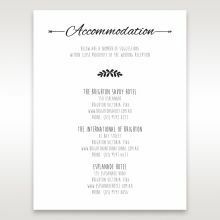 The team at Giant Invitations ensured all our questions were answered, invitations printed on time and always touched base with us when needed. The after hours Live Chat Support was also exceptional as well. I will be recommending Giant Invitations to others. THANK YOU!!!!! So glad we stumbled across this site. Giant Invitations has saved us so much time, and when planning a wedding, that's not to be taken for granted! We found a design that matched our theme so we ordered a sample which arrived quickly. We weren't sure what the quality would be like, ordering an invitation however when it arrived we were both very pleasantly surprised at how beautiful it is. Definitely recommend! I spent such a long time researching invitations and couldn't find what I was looking for until I came across this website. Such a lovely invitation for a casual event such a Baptism. Invitation was exactly what I wanted - thanks Giant Invitations! So easy to order and received the invitations in the mail well ahead of the event. Thank you Giant Invitations for such an easy process to order my invitations. Finding a good quality invite at a decent price was one of the hardest parts of wedding planning. Thank goodness I stumbled upon Giant Invitations' website. There were so many styles I loved!! I ordered a few samples and the product was exactly as pictured. Great quality!! Also, being able to fully customise the invitation set was such a bonus! We couldn't be happier with the product and service. I cannot wait for our real invites to arrive!! I found giant invitations when searching on google and am so glad that i stumbled across it. It is super easy to use, has tons of options and was so thrilled there were a variety of wording samples to choose from. I was impressed with the price and how quickly they were able to answer any of my questions. I will definitely be recommending and coming back to giant invitations for my future invitation needs! 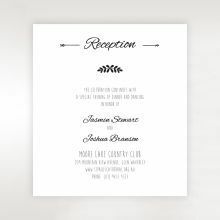 After searching the internet for hours on end I finally stumbled across Giant Invitations Website and found so many beautiful invitations that I loved. I ordered several samples and was so impressed with the quality and workmanship. The process for ordering is so simple and the online chat makes this process even more simple. I will certainly be using Giant invitations for our wedding and for many more events to come. I ordered quite a few of the samples of the different wedding invitations and was pleased I'd received them within a couple of days. They were all beautiful and while they were pretty simple for the most part, they looked incredibly elegant and classy. Out of all the samples, it was this invitation in particular that I fell in love with. It just works. It looks beautiful and is a little different from the normal burlap and lace invitations. Cant wait to the real ones arrive! I stumbled across Giant Invitations in a Google search and I haven't looked at another website since! The samples I received was amazing, great detail and quality. I ordered 3 samples all of which were amazing. It was packaged really well and presented in a beautiful enveloped / pouch, I was really impressed! I have now decided which invitations I will order. I had some questions so I did a 'live chat' and was extremely helpful, I highly recommend the live chat for any questions! Love the colour and quality. At the start i am not sure whether the vintage looks good or not, but when i received the products, it loos very good quality and i don't have to pay a fortune to get these quality of products. Very special laces pocket in this design, and i love the little white strip to make it nice and tidy. My fiance and I would recommended this design if you are planning the wedding on the beach. We received the sample for this and I absolutely love the quality. The materials used for both the invitations and envelope don't feel cheap which is awesome. We can't wait to receive our order and we will definitely be going to Giant Invitations next time we need to make invites for a special occasion. I would recommend this site to all my friends and family!! We first ordered some samples. We were so happy as within 48H we received the samples by post. The templates were really helpful and the online chat very helpful as well. We ended up ordering the invitations with the wishing well cards. So pleased with the results! Is rustic but at the same time elegant. We highly recommend this style and have received numerous compliments on the beauty, and the light and funny wishing well poem. We ordered the invitations along with RSVP and wishing well cards. We were both very pleased with the quality of the invitations and how easy the ordering process was. The laser cut pockets were beautiful and the string with gold in it complimented it perfectly. 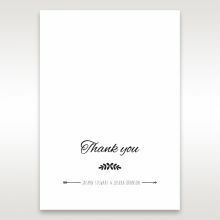 The designer overlooking our invitations gave welcomed feedback and suggestions.We can highly recommend this style and have received numerous compliments on their elegance. They say first impressions last and upon ordering our samples, they were posted to us in very professional packaging that stood out from other samples I have received that have just been sent in a stock standard envelope.On a trip to Melbourne I also went in to the store and they have a wonderful display of all their invitations. There is such a variety and the quality of every one of them is honestly excellent.I have researched SO many different invitation sites and shops but the quality and price of what's available at Giant Invitations is the best by far, The prices are so affordable that I can get everything I want without scrimping on price, and also have flexibility on how I want the invitations to look. Very happy! Great quality invitations at a really great price. We ordered quite a few samples to ensure we picked the best one to suit our wedding. The samples where delivered only a few days after placing the order and upon arrival we where really surprised and happy with the detail and feel of the invitations. We really can't wait to order our actual wedding invites be proud of what we give to our guests for our special day. Our sample invitation was absolutely everything it promised to be, the quality and attention to detail that has been put into this unique invitation design is just incredible. 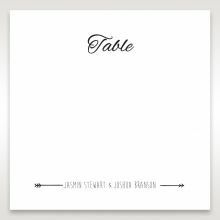 I absolutely love the style, and elegance this will bring to our day and I cannot wait to have our very own personalised invitations arrive! Highly recommend this product to all the soon-to-be brides out there, its wonderful knowing these invitations are guaranteed to be as beautiful as the special day that is to come!! Great quality invitations at an affordable price. Loved all of the samples that we ordered, it made the choice even harder. Quick delivery. Great product. 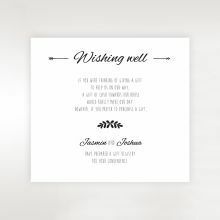 I just wanted to say how happy I am so far with the Giant Invitation team they have been so responsive and informative from the moment I found this site for my invitations. I've had 101 questions for theses guys as I am a stress head and each time they have just made me feel so at ease with it all so thank you . I was so happy with the quality of the sample invitation I was sent and cannot wait to see the final product of my invitations. When looking for wedding invitations I made the mistake of ordering from a US company where the invitations were made in China. Reason? Because they were low cost and looked nice. All in all I ended up wasting $140. I decided to use this website to order new invitations as they looked amazing even though the price is a little high. I have to say the service that I received was fabulous and they are extremely patient with making sure that every little detail is catered for. The invitations look beautiful and the quality is perfect. Overall so so happy and would definitely recommend to anyone. These samples were lovely. All packaged up safetly and a real easy look into what the real deal could be like. Wonderful. Samples were sent very promptly. Quality is perfect and exactly what I was looking for. Really nice stock paper and kraft card with the die cut. 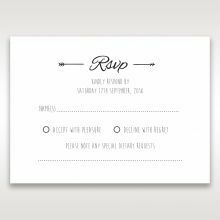 These invitations are simple but elegant. The cut out lace pattern looks beautiful. Very easy to order and quick postage. I ordered a variety of samples as I wasn't sure what I was after and I need to see things face to face before I am satisfied with a product. My samples arrived within days of ordering and I was pleasantly surprised by the quality of the product. The paper was sturdy, the ink was vibrant and even the envelope was high quality paper. Really happy with how efficiently samples were delivered. I can definitely vouch for the quality of the product. I ordered a sample of this invitation and when it arrived the quality and finish was so much higher than expected. This invitation style is perfectly suited to the vintage/rustic theme, the insert slides out of the pocket easily and overall the paper stock is a really amazing quality. I ordered a sample for our wedding invitation. The sample is stunning, high quality and exactly what we are after. We are now ordering our invites. The whole process was incredibly easy and efficient. Would recommend Giant Invitations to anyone!